The Talmud, in Mesechet Megila 14a, lists Esther as one of seven female prophets in Tanakh: “There were seven female prophets. Who were they? Sarah, Miriam, Devorah, Hannah, Avigail, Holda and Esther.” The reason for three of these women’s appearances on the list is clear: They are called prophetesses in the Torah. Three of these women require some interpretive gymnastics, but their cases basically make themselves. Then there is Esther. How exactly, in the only book of Tanakh where God does not appear, might the protagonist be a prophetess and a model for those of us who think deeply about the purposes of Jewish education? On the third day, Esther put on malkhut and stood in the inner court of the king’s palace, facing the king’s palace, while the king was sitting on his royal throne in the throne room facing the entrance of the palace. It’s not every night that Stephen Colbert talks Tanakh. 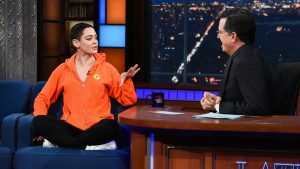 Last week, in a somewhat unusual interview, actress and activist Rose McGowan brought up the biblical story of Jonah to explain her distaste for organized religion. “You… are not,” replied Colbert. “I’m not?” McGowan seemed perplexed. Colbert fills in some details of the story, but McGowan was already moving on: “It eventually gets to Jesus, right?” “Eventually, everything goes to Jesus,” he agreed. My students and I were in the middle of discussing Genesis 12:10-20, the story in which Abraham asks Sarah to say that she is his sister as they descend to Egypt. The Torah, however, does not record any dialogue when they arrive in Egypt, so that we don’t know what, if anything, Sarah said. 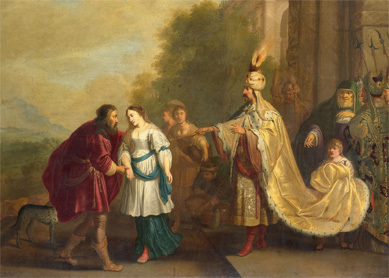 Later, when Pharaoh, who took Sarah as his wife, discovers that she is indeed a married woman, he asks Abraham why he said she was his sister. Saul, a passionate and excited student, raises his hand with a possible resolution. Saul: And they didn’t lie but they didn’t correct. And then the courtiers went to Pharaoh and were like, “Oh ya, there’s this girl she’s Avram’s sister.” So then Pharaoh assumed that Avram told them that Sarai was his sister. Ziva: Love it! Stronger with textual evidence. I think–textual evidence doesn’t have to be spelling it out for you. This is literature. This is Torah. There can be hints. There is an interpretive activity that lies at the heart of “advanced” literary analysis as well as rabbinic hermeneutics. It focuses on the details in the text–the words, the syntax, sometimes even the individual letters–in order to make meaning. This privileging of the smallest units of analysis guides new criticism’s close reading and often directs the flow of a daf of Gemara, so that every letter, every seemingly superfluous word, every missing word, teaches us something. For most of my career as a Jewish studies teacher, I held this type of interpretation up as the gold standard. The value of Saul’s interpretation would stand and fall on whether or not he could make a textual case for it. I wanted to teach this style of interpretation because I believed it prepared my student for both literary and religious text study. When I was a high school Tanakh teacher, many of my students rose to the challenge and met my expectations. They made meaning out of extra vavs and repeated phrases. They juxtaposed subjects called by proper name and subjects called by pronouns. Some of my other students did not care for it and eventually found themselves utterly uninterested in the study of biblical texts. It was with these students in mind that I entered my doctoral program in curriculum and teacher education. What does it mean to a student to understand rabbinics? While rabbinic texts have long played a central role in the development of contemporary Judaisms and Jewish day school curricula, we don’t know very much about students’ learning. While we have some sense of what teachers and other experts think constitutes an understanding of rabbinics (Levisohn 2010, and Kanarek and Lehman 2016), there is little data about what students actually know about or are able to do with particular texts, or what sense they make of rabbinics as a whole.